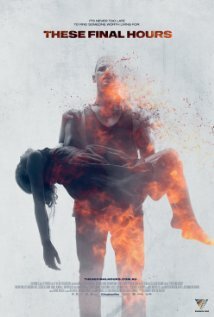 These Final Hours is what it says: the last hours of Earth, burning to ash as a planet-killing meteorite does the business — the science feels a bit dodgy, but the story is superb. In the tradition of On the Beach, this beaut Aussie flick traces how James (Nathan Phillips), who admits, finally, that he’s made a few bad choices — hence the prison tats, the wake of disappointment he trails after him — chooses to while away his last moments. Among the options are with his girlfriend at the beach, waiting for the end; with his other girlfriend at a killer party; or less likely, with his sister and her family, or with his mother. Others have chosen different courses: suicide, violence, hedonism, and desperate survival tactics such as wrapping a house in aluminium foil or digging bunkers. James is en route to party away his fears when he chances upon, amid the anarchy, a young girl in need of help — for once, he makes the right decision. Rose (a delightful Angourie Rice) brings with her conscience and a sense of sacrifice — yes, this road movie is about redemption and finding a sense of self-worth where perhaps there was none. Rather than wanting to numb himself to the pain of that last moment — that last realisation — of mortality, James is given the option of embracing it, and being a better person for it. There’s a sepia tone, a summer heat, infusing the film, and the soundtrack is well crafted — a jazz number out on the farm, dance for the pool party at the end of the world, and nothing anywhere else but the natural sounds of the world ending. The absence of music adds to the atmosphere and enhances the attempts to drown out reality. There’s a voice on the radio counting down the hours as the planet boils and James dashes from one event to the next, meeting himself everywhere he goes, with the perceptive Rose riding shotgun. There is a wonderful conversation between James and his mother that says so much without having to say much at all; the reactions of the characters not only to the apocalypse but to James are convincing and telling. Written and directed by Zak Hilditch, it’s a relatively minimalist movie, intensely focused, offering tension and pathos in equal measure. As one of James’s girlfriends, Zoe (Jessica De Gouw), says at one point: it’s beautiful. Check it out at the These Final Hours website. This entry was posted in movies, review, science fiction and tagged apocalypse, these final hours, western australia. Bookmark the permalink.